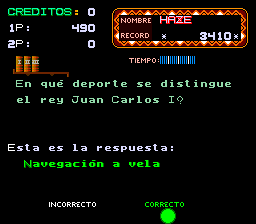 Master Boy is a Spanish quiz game made by Gaelco. Many years ago Charles MacDonald painstakingly extracted the internal ROM of the HD647180X0CP6 MCU used by Master Boy by exploiting a bug in the game’s string handling to output the internal ROM data, then handfix some bits that couldn’t be accurately dumped that way. This was done before decap techniques were available, so was something of a miracle that any method could be found to dump the rom. I then emulated it with the help of some notes he had made. Actually, the above isn’t quite what we ended up with, because prior to last month we were running a set with the copyright message in the startup box hacked out and nobody had noticed, but that’s an aside. There were however two things that didn’t quite add up here. 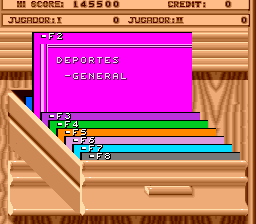 We had sources that suggested Master Boy was a 1987 game, or possibly even a 1986 game. We also had sources that said there was a ‘Master Boy 2’ from 1991. 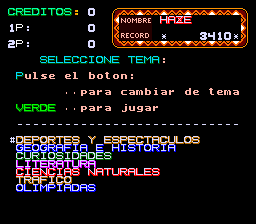 The PCBs for the emulated Master Boy were marked as revision A, so it was speculated that maybe there was just an earlier set from 1987 we hadn’t found yet, but we’d seen no solid evidence for a ‘Master Boy 2’ at all. This was clearly not the same hardware as the emulated Master Boy, it’s a much simpler PCB using a Z80 instead of HD647180, an AY8910 for sound, and very little else; it’s a very simple PCB. 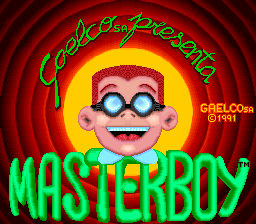 The PCB was said to be for the 1987 version of Master Boy. I quickly went about emulating the game, giving me the following. 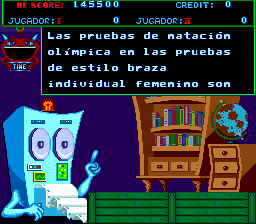 So that concluded the 1987 version of Master Boy did exist, and was an entirely different piece of code. 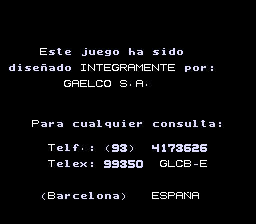 This newly emulated game is the real ‘first game ever made by Gaelco’ after they split from Tecfri in 1986. It is possible there is still an earlier revision than this as some sources still indicate 1986, but if that earlier revision exists it’s likely to be on this same PCB. 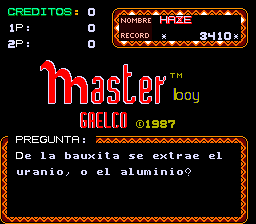 This also very likely means the elusive ‘Master Boy 2’ is in fact just the version we already had emulated, it’s clearly a sequel to this 1987 game, but for whatever reason Gaelco opted to not put ‘2’ on the title screen. Anybody who had played both back in the day would have remembered the 1991 as a sequel, which is where the ‘2’ likely came from. 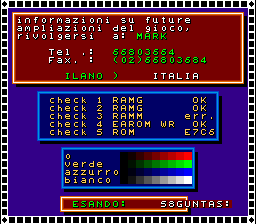 This seems an Italian PCB – notice “domande” silkscreened near the question ROMs. 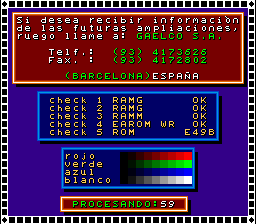 I can buy it and send it to capsoff or whoever if you can verify who wants to extract the internal ROM. Of course if bidding doesn’t get crazy. would be better just waiting for one where we know the startup screen is correct on real hardware, no screenshots could easily be a conversion. plus I don’t think it’s especially rare.